•Static clings are made from highly plasticized white vinyl film that does not require an adhesive to adhere to polished or smooth surfaces such as glass or mirrors. • Static Clings have a release liner on the back and do not require any special skills or tools to install. •Static cling are easy to remove and do not leave any adhesive residue. • Static Clings are mostly used on windows for promotions, special advertising, announcements and many other uses. Static clings can be stored and reused if properly removed and stored over the original release liner. The following is a general recommendation on steps that can be taken to apply static cling vinyls. Many of the points highlighted have proven to supply trouble free performance after the application is undertaken. APPLICATION SURFACEClings may be applied to a variety of smooth polished surfaces such as glass, plastic, chrome, and high gloss smooth, painted surfaces. WARNING In areas of extreme fluctuations in weather conditions and temperatures, there can be problems with the suns heat on the clings causing the windows to expand or contract to quickly, which may cause damage to the window. 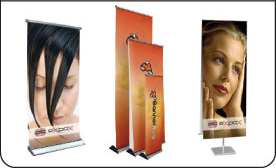 Banner stands, retractable stands, roll up, X Banner Stand, L Stands and more for trade show , exhibits and Point of purchase. 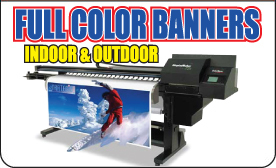 Vinyl Banners, custom banner printing, full color digital banner printing, high quality and outdoor durable banners. 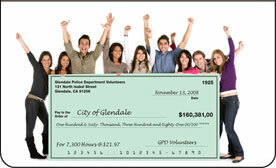 Banners are professionally designed and is offered free with a purchase of banner, choose from thousands of designs. A- Signs, Sidewalk signs and poster stands for your business advertising and promotions. Choose from many available stands. Printing in full color on foam board, gator board, PVC, Vinyl, coroplast and aluminum. Using outdoor and UV protected inks. 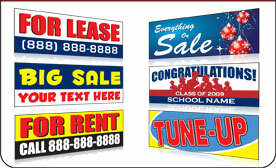 Check out our huge inventory of pre designed poster banner signs and window signs. 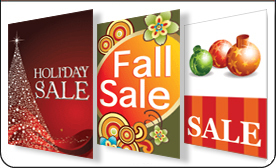 Such as Holiday signs, Sale Signs and more. 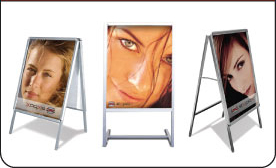 DPSBanners.com offers the largest selection of banner sign designs, retractable banner stands and portable displays for trade shows, retail business advertising and sales promotion. Fast production and discounted prices.